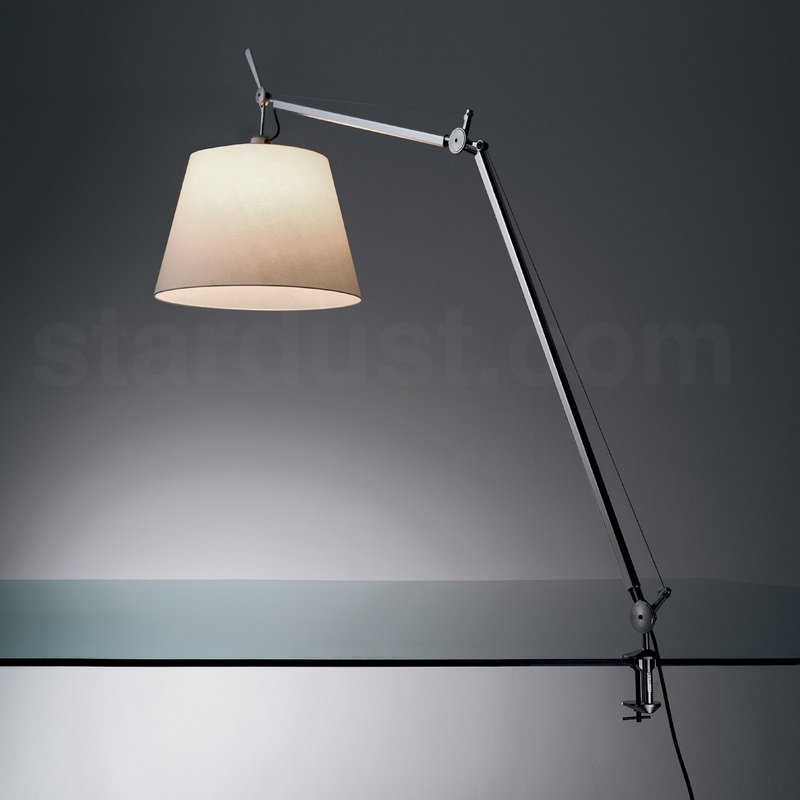 Tolomeo MEGA Clamp With Table Lamp Clamp by Artemide Lighting - Artemide Tolomeo Mega Table Lamp with clamp; a sophisticated task lamp that offers both direct and diffused illumination, available from design purveyor Stardust. 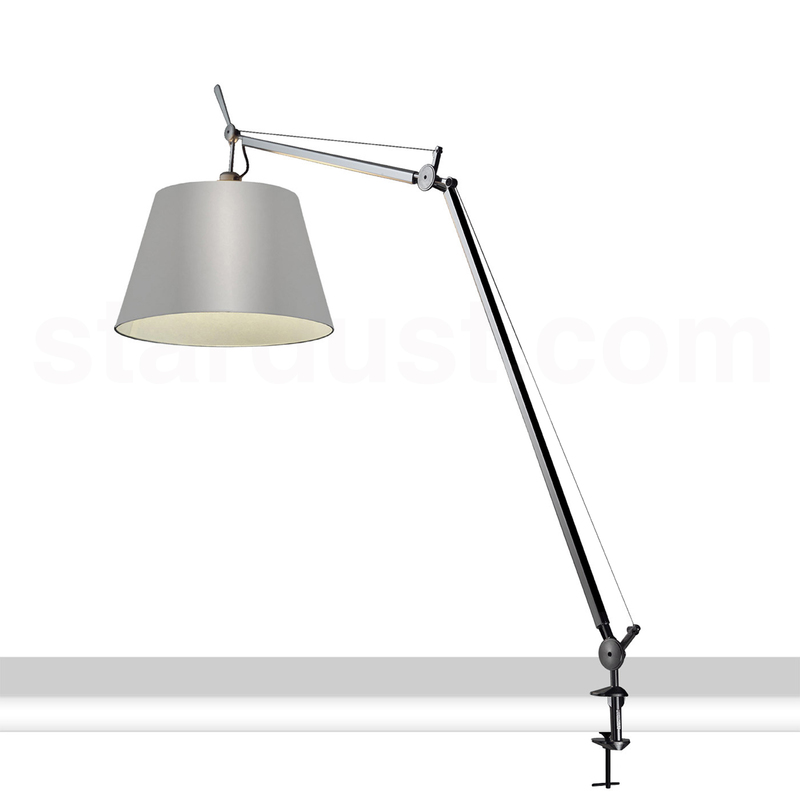 Designed for simplicity and engineered for task illumination, the Artemide Tolomeo Mega Clamp Lamp combines the beauty and functionality of the classic Tolomeo Lamp with a refined diffuser in either parchment or fiber. The lamp's practical clamp effortlessly grips to the edge of any table. Designed by the legendary designers Michele de Lucchi and Giancarlo Fassina, this lamp is one of the most popular choices with offices and libraries. The simplicity in design with its elegant diffuser perched atop the classic Tolomeo arm structure fits well in almost any decorative theme, be it the home or the office. The Artemide Tolomeo Clamp Lamp is a table-mounted desk lamp for adjustable direct and diffused incandescent or halogen task lighting. Fully adjustable, articulated army body structure in extruded, brilliant, natural anodized aluminum. Joins, tension control knobs, and mountings in polished die-cast aluminum, support cables in stainless steel. Diffuser with aluminum frame, available in parchment paper or in pale grey satin and polycarbonate fiber blend. Clamp in die-cast aluminum. Dimmer on cord.